The first way to improve your web experience is use Facebook to eliminate the need to create and register a brand new account for every single website. The web forms that ask for your name, your e-mail, and subsequent prompts to upload a profile picture and find friends are things of the past. As an example, check out how you can create a new account on Quora, a question-and-answer site. When you go to the Quora sign-up page, you’ll notice that it shows that you can register by using an existing Facebook or Twitter account. Clicking the Sign Up With Facebook button brings up an App Install Screen in a new window. This one simply asks you to click Okay on sharing your public profile, Friend List, e-mail address, and likes. If you aren’t logged in to Facebook, you see a Facebook log-in screen in this space, where you have to enter your Facebook log-in e-mail and password. Also, if you share a computer with other Facebook users, make sure that the name displayed is, in fact, yours. Just like clicking any of the App Install buttons, the moment you click Okay, your information will be shared with this site. Make sure you trust the site that you’re using before you click Okay. WellknownMcgoodreputation.com? Probably okay. SleazyMcSpamerson.com? Maybe do a little more research first. 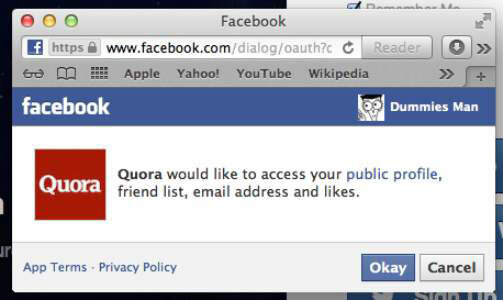 After clicking Okay, Quora goes on to ask permission to post to Facebook on your behalf. You can set privacy on who sees those posts or, in this case, choose not to let Quora post by clicking Skip. After you go through these install screens, youcan begin using Quora, including, in this case, selecting topics you’re interested in learning about. The sign-up process will be slightly different for each site that uses Facebook as a log-in option, so don’t worry if the site you’re using has a slightly different look and feel than Quora. Each time you return to a site like Quora, you’ll be able to log in by clicking the log-in button. You may also see mini thumbnail photos of friends who have previously logged in or registered through Facebook. Often when you log in with Facebook, you will be asked to create a new password for that website. Do not use the same password you use for your Facebook account. That lowers the security of all your online accounts.